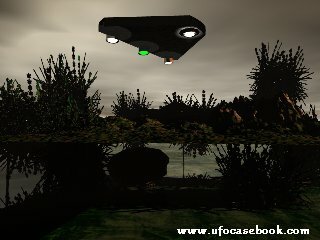 The following UFO case comes from Skywatch International, and the National UFO Reporting Center. A very detailed investigation was done on the experiences of four hunters camping out in the state of Idaho. These four men would encounter a huge UFO, turning a restful, enjoyable hunting trip into a night of terror... a terror that still haunts them to this day. This unusually frightening experience occurred on September 27, 2000, in the central part of Idaho. The four hunters were old friends who had visited the same region for over twenty years, and always looked forward to their Autumn trips. The actual event began at 9:45 PM, on a cold evening, as one of the hunters made a short walk from camp to his pick-up truck to get some food from his storage chest. As he approached the truck, he was overcome with a strange feeling... a feeling from above, like something was just not right. Only a few moments would pass before his realized that his strange feeling had a basis. As he reached into the bed of his truck, his flashlight illuminated the night sky above him. He was startled to see something extremely large right above him, where it should not have been. He fell to his knees from the shock of the sight of the bottom of an immense, triangular shaped object. The object was filling the dark sky above..silently and motionless. His first estimation of the object was that it was at least the size of a football field, several hundred feet on all sides. The corners were slightly rounded, and its exterior exhibited a distinct texture. The size of the object was so immense that it seemed to hide the entire sky above him. The frightened 43 year old hunter began to yell for the other three to come outside, and verify that he was not seeing things. The other three would vividly remember the sound of his voice, a hysterical, scared voice, calling for help. At first, they thought that a bear was upon their camp, and was attacking their mules, or worse, their friend. They rushed to the door of the camper. Nothing could prepare them for what they were about to see. Two of the hunters were able to reach outside in time to see the object overhead, as it slowly began to move away. It moved without a sound toward a nearby mountain. The two remembered a faint whining sound, which occurred simultaneously with the glow of lights on the underneath of the craft. They would then observe a white light, which was visible at each of its three corners. A red light strobed from the middle of the belly. Two of the hunters grabbed their binoculars to get a closer look. They were almost transfixed as they watched the unworldly object for at least 60 seconds. As the object began to ascend and move up a narrow canyon in the nearby mountain, the men stated that the craft moved "like a hockey puck gliding over ice,--very smooth and unwavering," according to the NUFORC investigative reports. After the event, one of the hunters who was a pilot would remark that the craft was "not moving through the atmosphere the way an aerodynamic body would." Totally stunned by their experience, and frightened to the point of moving to a motel, three hours away from their campsite. The NUFORC report would state, "One of the two, the first to witness the object, spent a very uncomfortable night, lying awake and thinking about the object he had witnessed hours earlier. He felt keenly on edge, and startled dramatically on one occasion, for example, when the electric heater in their room suddenly came on," said NUFORC. The next morning, the hunters contacted local government authorities, and the NUFORC offices. They gave all the details of their experience, including the coordinates of their campsite. As to be expected, nothing was forthcoming from local government, but NUFORC was on the scene immediately, and made a full and detailed report. The triangular shape of the object has been reported many times during UFO sightings, and has been captured on photo and video. What was the source of this strange, eerie object which moved across the mountains of Idaho that night? The case is still listed in the "unexplained" category.